I have never been into St. Valentine’s Day that much. First, because we didn’t celebrate it in Bulgaria when I was growing up. Instead, 14th February there is the feast of the Patron Saint of the vineyards and the wine. So, as you can imagine, on this day the whole country traditionally gets, to put it politely, just a little bit drunk. The idea of St. Valentine’s Day started to trickle slowly after the Fall of the Berlin Wall (yes, I am ancient, I remember that). Some humble red hearts began to appear in flower shops and the young ones, eager to embrace the new things from the West, started to mark St. Valentine’s. I am afraid to say that I contributed to its adoption, too in the shape of an article explaining what the day stands for and how to celebrate it. My piece was published in a local youth newspaper (long since defunct) and was read on the local television channel. It was a big thing for my teenage-self. However, if you are one of my countrymen who oppose the cultural adoption of non-Bulgarian things, I can only apologise. The truth is that with or without me, St. Valentine’s Day would have made its way in. The idea of 24 hours dedicated to romantic love is too seductive to be ignored. After I moved to London in December 2000 my love for St. Valentine’s crashed and burned. I got really put off by the commercial spin of it all. Shop displays would turn red as soon as the Christmas shopping campaign was done and dusted. Commercials were trying to convince us (quite successfully at that) that you were a loser if no-one sent you a bunch of flowers, a box of chocolates and a cuddly toy – preferably a teddy bear – exactly on this day. 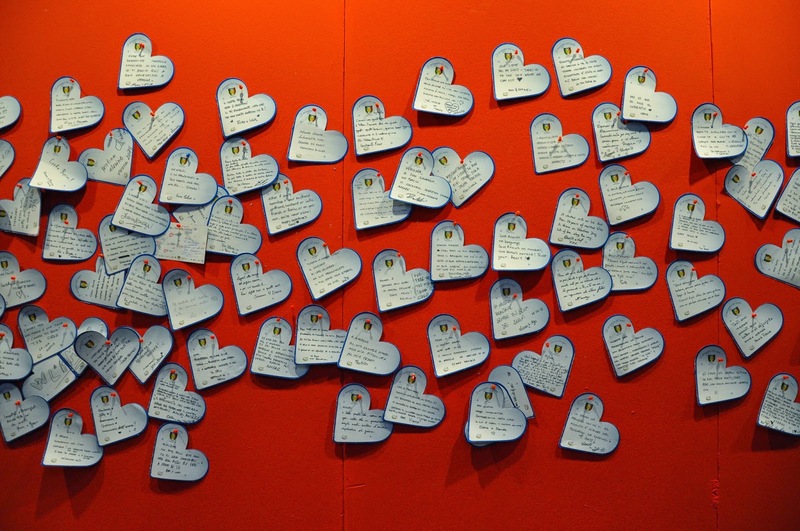 No matter what your other half did for you through the rest of the year, unless he performed in a specific global-marketing-defined way on 14th February, he simply didn’t love you enough. Heaven forbid you found yourself single on this day. It was like the end of the world and then some. So, I went off St. Valentine’s big time. Even after I met my husband we never really made much effort to celebrate 14th February. I mean, he would always give me a lovely card and flowers. As for me, I would give him a huge card, especially if the previous year I had forgotten to buy him one. We even got engaged on 11th February in Venice and as such established our own personal holiday that St. Valentine can’t touch. As you know, now we live in Italy. Surrounded on a daily basis by fabulous examples of world-class art, architecture and design, I couldn’t help but notice all the raw passion and all the deep affection that had gone into shaping Italy as the most romantic place on Earth. Sensations here are heightened, emotions are prized and love is… Love is nothing to be ashamed of, nothing to hide, but it is instead the essence of it all. You look at Michelangelo’s David and you fall in love. You look at Cinque Terre and you fall in love. You eat a soup made of fish caught that same morning and you fall in love. You have a flaky chocolate brioche for breakfast and, yes, you fall in love. It is so easy to fall in love with Italy and when you remember that San Valentino is in fact a Roman saint, it is easy all of a sudden to feel excited about its (otherwise quite commercialised around the world) day. So, this year, as never before, I actually had a plan for the 14th February and it entailed driving up to Verona to spend the day wandering around town feeling in love. Simple, but effective, I thought. No fancy restaurant meals squashed together with other couples. No expensive presents that we really didn’t need. No, just a sweet little walk around the most romantic city on Earth (hey, Paris, take that!). 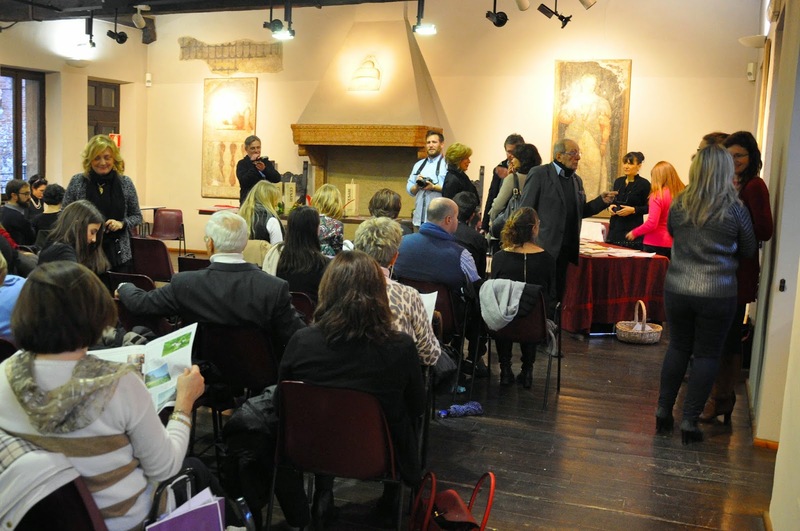 It also helped that Verona was in the midst of a four-day extravaganza dedicated to love. 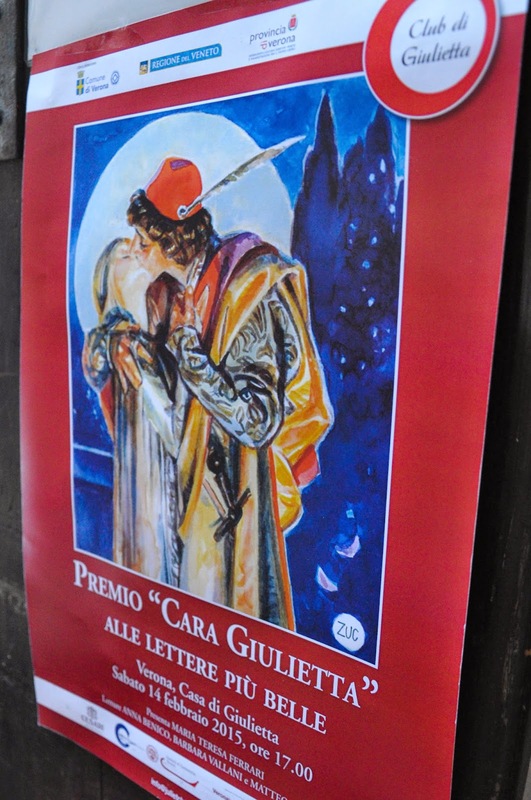 Red hearts were adorning streets and squares, a heart-shaped market was taking place at Piazza dei Signori and Juliet’s House was beseeched by both singles and couples, not to mention an award ceremony ‘Dear Juliet‘ for the best letters sent to Juliet taking place inside. 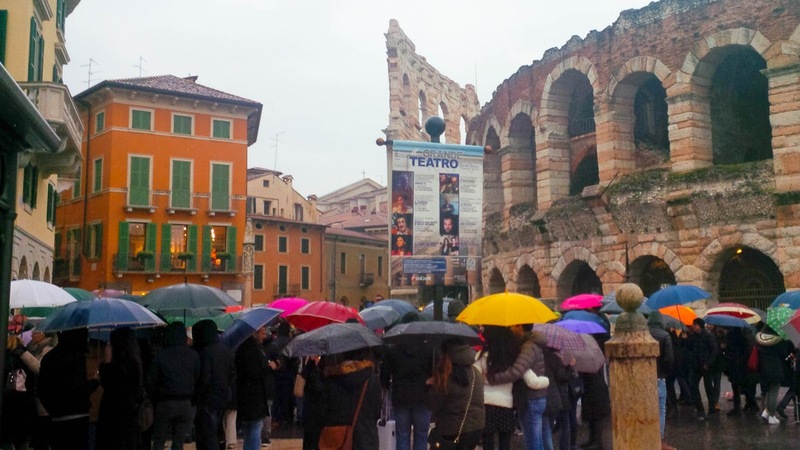 We didn’t count with the torrential rain that drenched Verona all of the afternoon. But it was so romantic to see the colourful sea of umbrellas covering couples walking around hand in hand. There was no hurry, no shoving and pushing, no aggression in the air which is so typical for the larger cities, especially in the grip of a larger holiday. 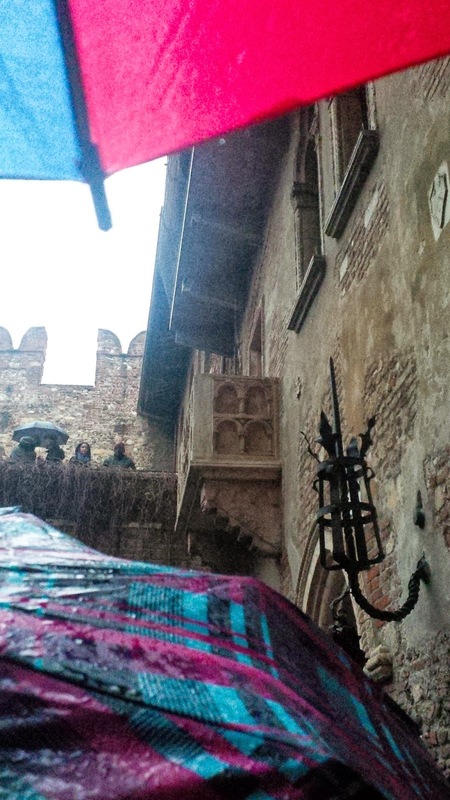 Even in Juliet’s House where the crowd was really dense, love and being romantic truly reigned. All eyes were fixed on Juliet’s balcony where a young man had just fallen on one knee. When the lady of his heart said ‘Yes!’, the whole crowd erupted in cheers and claps. Holding tightly our own umbrella and our baby’s buggy’s handle, my husband and I looked at each other and my faith in San Valentino and in the need to celebrate his day was restored. Happy St. Valentine’s! May you celebrate it every day of the year for years to come!